SamTrans, Caltrain Step Up During BART Strike – Peninsula Moves! 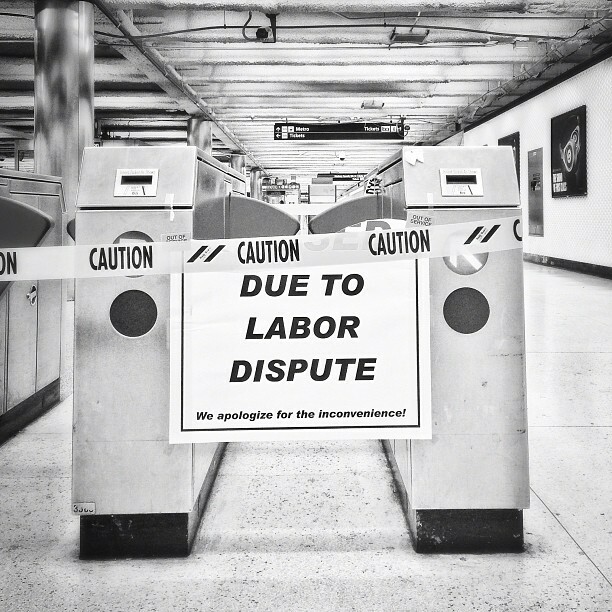 This Instagram image by @cujojp captured the sight that greeted commuters at BART stations during the strike. The four and half day BART strike that began Monday, July 1 and ended Friday afternoon, July 5, put Bay Area transit agencies to the test. Representatives from the San Mateo County Transit District, which operates SamTrans and Caltrain service, participated in a series of regional planning meetings to look at agency resources in the event of a strike. A Bay Area-wide plan was coordinated by the Metropolitan Transportation Commission to provide additional service for stranded riders. But the key message for commuters was to expect delays, be patient and, if at all possible, to stay off Bay Area freeways during peak commute hours. SamTrans and Caltrain updated contingency plans developed in the 1997 BART strike. While many things remain the same, there have been significant changes in transportation services in the last 16 years. In 1997, the BART extension to SFO, with the cross-platform transfer between BART and Caltrain at the Millbrae station, did not exist. SamTrans, which operated eight express routes to San Francisco, now operates only one, Route KX. Caltrain had not re-engineered its services to include Baby Bullet express and limited-stop trains. In addition, ridership on many forms of public transportation was lower in 1997. In 1997, weekday ridership on Caltrain was 26,000 a day; this year, weekday ridership has surpassed the record-breaking 50,000 mark. While the impact on the Peninsula was not as great as it was in the East Bay, more than 45,000 riders board at stations on the BART extension every weekday. This includes the Colma, South San Francisco, San Bruno, Millbrae and San Francisco International Airport stations. Although SamTrans and Caltrain could not accommodate all of these riders, they were able to offer some temporary service that helped ease the difficult commute. As in the previous strike, SamTrans buses did not operate inside BART stations, but served temporary stops on the street. A free shuttle from the Colma Park and Ride lot connected to Muni on Mission Street. In addition, SamTrans provided extra buses on its mainline Route 391, which travels to the Temporary Transbay Terminal in San Francisco. The extra buses were used during the peak commute to provide direct service to the terminal. Between the free shuttle and the extra service on Route 391, SamTrans carried between 500 and 1,000 additional customers each day. Caltrain also saw new riders who would have ordinarily used BART looking for alternate ways to get to San Francisco. Based on ticket vending machines sales at the Millbrae station and passenger counts in San Francisco, Caltrain accommodated between 4,000 and 6,000 additional riders on Monday and Wednesday. Tuesday had even higher ridership with an additional 8,000 to 10,000 riders. These riders were absorbed onto standing-room-only trains.. Some northbound express trains made an extra stop at Millbrae to provide more service to stranded commuters at that location. In 1997, Caltrain carried an additional 2,735 riders during the morning commute, an 80 percent increase over its regular morning commute of 3,400 riders. The impact of the strike was felt throughout the agency as administrative personnel pitched in to help direct new riders. Ambassadors at the Millbrae station during peak commute hours helped new riders purchase tickets and board trains. SamTrans also stationed additional personnel at key transfer points to monitor ridership and help customers. The Customer Service Center received between 700 and 1,000 additional calls each day from riders looking for trip planning information. On Monday, they answered 2,195 calls, a significant increase from the usual 1,400 calls received on an average day. Specials messages at bus stops at the Millbrae station directed SamTrans riders to temporary stops outside the station. Temporary signs also were posted inside the station to direct customers to buses and Caltrain.